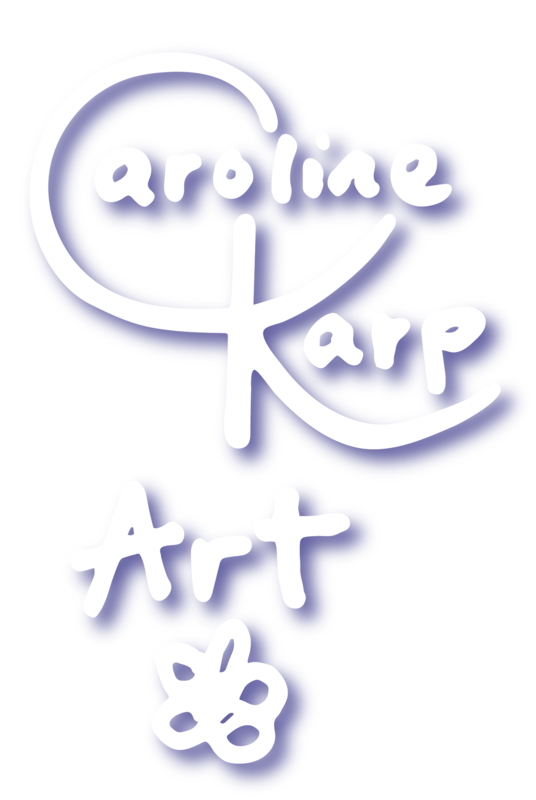 Expressionist Painter – Why I Paint Water is written by artist Florida Artist and environmental activist Caroline Karp. 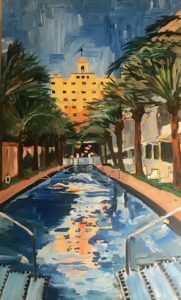 This Enlightened Artist Blog is for all the people that live along Beautiful Bayshore Blvd, anywhere, love the water and want to know why this expressionist painter paints water. 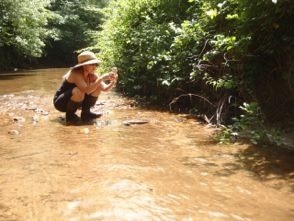 I love to explore water – especially in my river boots. DO YOU LIVE ON BAYSHORE BOULEVARD – OR DO YOU WANT TO? I’m pretty sure that there are Bayshore Boulevards all over the world. I’m also fairly certain that the houses that line these boulevards are spectacular! Mostly because of their stunning views of the water and all that lives in and around the water. If you live by the water, your view will change thousands of times during each day. Each morning will be different from the morning before and the same goes for the sunset. I’m so interested by what happens to the color of the water and what can disturb the surface of the water. Most people think of the color blue when they see the water. Yes this is true. However, it’s not just one iteration of blue and my paintbrush loves to find all of them. One of my passions is floating down a crystal clear river in my Kayak, that I lovingly call Santee. It’s a place of serenity and meditation for me. In other words, it’s a place that I can quietly be with nature. 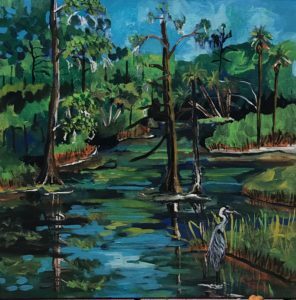 Floating Down the Rainbow River 24×24 in my kayak named Santee. The next time you are looking at the water, just look at the reflections. If the water is calm enough, well the image is a mirror of what is happening in the sky. If the sky has pink, purple, orange and grey. Therefore, the water will too. I find water to be soothing and meditative and chose to live right by the water so that I can walk my dog every day alongside of it. This painting below is what I look at every day when I walk my dog Arya. Perhaps you have seen me? 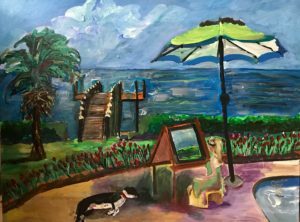 Just for fun I painted a self portrait of me painting my view along Bayshore with my dog Arya sunning herself. 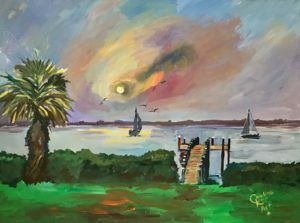 I had a solo art show in a cute bungalow that was in the heart of Safety Harbor, which just happens to have a view of the bay. The same bay that you see pictured in these paintings. In addition, my solo shows about water will be a travelling exhibition that may be coming to a city near you. The next location is Highland Museum of Art in Sebring, Florida. Please click over to my Exhibitions page (RSVP) to get put onto a special list of invites. 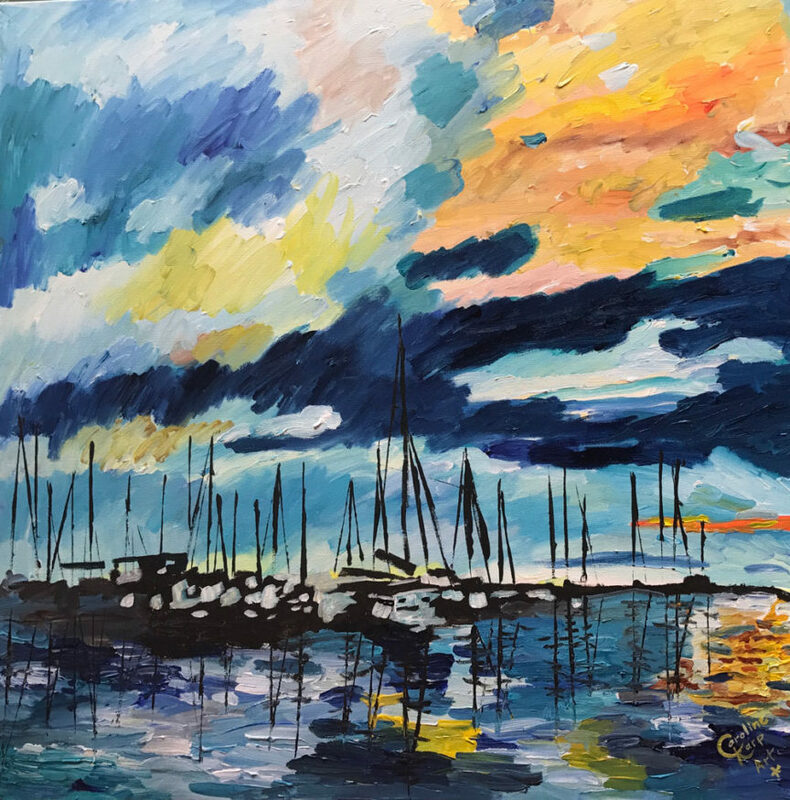 I wrote another blog post, Expressionist Painting of a Sailboat and It’s Crew, that talks about this very show. Therefore, I’m going to insert it here. The show was fantastic and was very well attended. Above all, the best part was the live painting that I did while the guests were watching . It is one of my best paintings. 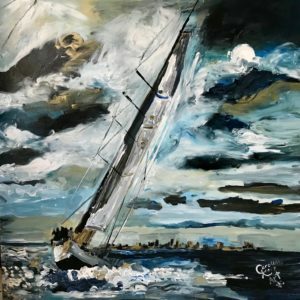 Dynamic and energetic painting of a Melges Sailboat cutting through the water of the rough sea. The crew is doing its job.